Today in Masonic History we discuss the Hands Across the Border Degrees. The Grand Lodge of Vermont in the United States borders on the Grand Lodge of Quebec in Canada. On November 18th, 2017, I had the privelege to participate in a unique masonic event. 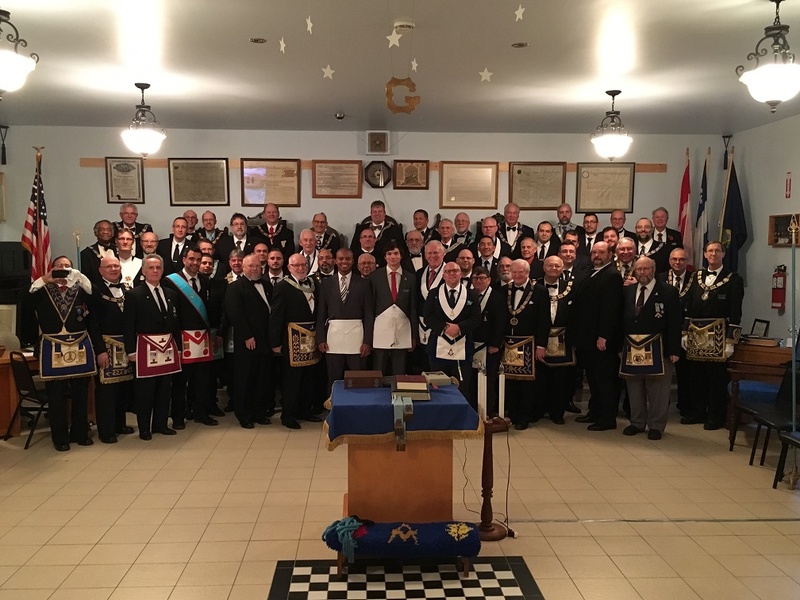 With the permission of the Grand Lodge of Vermont, I was part of a team that put on a first degree in Standbridge East, Quebec, Canada. The idea of the day was fairly simple, in the morning our hosts would put on a first degree with their ritual and in the afternoon the team from the Grand Lodge of Vermont would put on their degree. We would then discuss the differences between the two degrees. Some of you might be saying "differences? There shouldn't be any differences." In fact there were many differences in how things were done and presented. As an example in the Quebec lodge they have a "Director of Ceremonies," where the Grand Lodge of Vermont has a "Marshall." It was fascinating to watch and listen during the Quebec degree to hear all of the items being comunicated to the candidate, they were out of order from my perspective, the wording of how they were communitcated were different, yet they were all there to be heard and seen. I bring this up not so much to highlight the event itself, without a shadow of a doubt the event is worth highlighting. I bring this up mostly becuase of perspective. Freemasonry has the capability to be many things to many many people. Sometimes it is the case within a single lodge, people interpret the philosophy of Freemasonry and fit it into their own lives. Sometimes, as we saw at the Cross Border Degree, it can be communicated differently. Often we become hung up on right and wrong in the Masonic fraternity. "This is how we do it, so it must be right." Or "Our Masonic code says this," and so that becomes the defensible position. The idea of Freemasonry going back to the earliest of Masonic lodges was to give education. When you read the Regius Poem (also known as the Halliwell Manuscript) you see that even in that document which dated to around 1391, education was important in Masonic lodges. Fast forward to the Enlightenment and you found men joining Masonic lodges so they could speak openly about new ideas for the world in relative security. The idea was not for these men to come together to have one set of ideas put forward, it was to allow for a conversation to take place so that all could discuss the ideas and share their opinions. It is through the education of the fraternity that we find ourselves open to new ideas. The more knowledge we take in the more options we can see before us. Sometimes we hear thoughts from someone new to the fraternity who sees things maybe we have missed, sometimes we see a presentation of a degree which we have seen many times before and pick up something new and sometimes, when we are fortuante, we see the material that we know so well put on in a different format, it makes us wonder, it makes us think and it helps to pull us out of the static way we see things and we "improve ourselves in masonry."